This baby anteater has an appetite for collecting all kinds of insects and bugs! With the touch of a button, you can quickly and safely gather up bugs to observe in the anteater’s removable belly chamber. After you’re done viewing the bugs, release them back into their habitats unharmed. 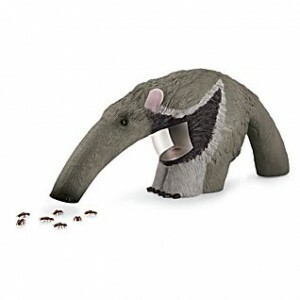 As seen on the Today Show, the Nat Geo WILD Anteater Bug Vacuum from Uncle Milton is nominated for 2013 Outdoor Toy of the Year from the Toy Industry Association. Toy lovers of all ages can visit ToyAwards.org to vote for their favorite playthings and sign up to win exclusive prize packages! Click here to visit National Geographic’s website. The product can be found at www.ngstore.com and local retailers such as Toys R Us and Barnes and Noble. WIN: 24/7 MOMS and National Geographic are giving away a NatGeo WILD Anteater Bug Vac along with a prize pack of other great National Geographic products. US entries only and one entry per person. Winner will be chosen on January 5, 2012. * We received a complimentary NatGeo WILD Anteater Bug Vac for review no financial compensation was received.